Mix dipping sauce ingredients together in a medium-sized bowl and refrigerate. Fry bacon, drain and let cool. Crumble bacon into cream cheese and add all additional ingredients. Mix together well. Place cream cheese mixture inside a quart-size GLAD® Food Storage Bag. Cut off one of the corners to make a pastry bag. Cut off the top of the peppers approximately ¼ of an inch from the base of the stem and set tops aside. Stuff cream cheese mixture in top of peppers and replace caps. Wrap each pepper tightly in foil. 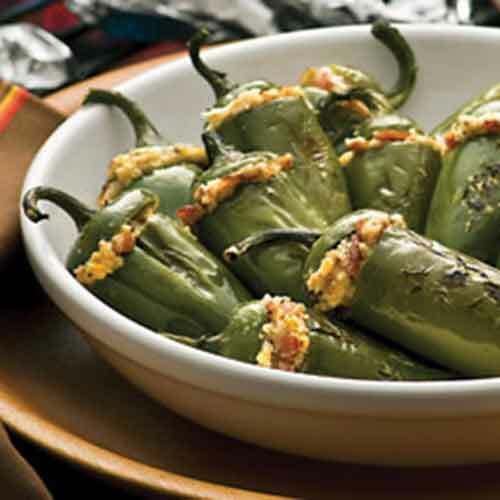 Place wrapped peppers on the grill grate directly over a hot bed of Kingsford® charcoal and turn frequently for 10–12 minutes. Remove from the grill, let cool, unwrap and serve with Hidden Valley® Ranch dipping sauce to cool down the spice from the peppers.